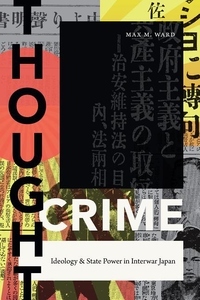 In Thought Crime Max M. Ward explores the Japanese state's efforts to suppress political radicalism in the 1920s and 1930s. Ward traces the evolution of an antiradical law called the Peace Preservation Law, from its initial application to suppress communism and anticolonial nationalism--what authorities deemed thought crime--to its expansion into an elaborate system to reform and ideologically convert thousands of thought criminals throughout the Japanese Empire. To enforce the law, the government enlisted a number of nonstate actors, who included monks, family members, and community leaders. Throughout, Ward illuminates the complex processes through which the law articulated imperial ideology and how this ideology was transformed and disseminated through the law's application over its twenty-year history. In so doing, he shows how the Peace Preservation Law provides a window into understanding how modern states develop ideological apparatuses to subject their respective populations.